Lucky Post is a state-of-the-art, full-service post studio based in Dallas, Texas, specializing in creative editorial. Built in 2012, the company has enjoyed rapid growth, and today, it has become a leading post house in the Dallas area. 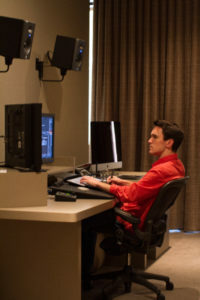 A key to the company's success is the ability to be flexible with their edit suites and storage infrastructure. Cross-platform shared workflows maximize the team's productivity and allows Lucky Post to serve a range of client projects simultaneously. One of the initial challenges during studio construction was to design a storage system that the new company could use for ingest and sharing of media between multiple seats of Adobe Premiere Pro. For connectivity, Lucky Post installed optical fiber to all edit suites, knowing that they would not be restricted as they increasingly moved towards higher data rate projects. For storage, the team bought a capable 160 TB NAS (network attached storage) system based on the popular open-source software FreeNAS. The FreeNAS based system provided the bandwidth needed, but required Lucky Post to create one large partition to hold all their project folders, leading to permissions obstacles with files. When the group decided to add a full-time Avid editor and workstation, they took a closer look at the requirements of having true project and media sharing where multiple editors can share bins and media simultaneously. Their investigation eventually brought them to Facilis and with the help of Barak Epstein and the team at VideoTex Systems, they invested in a TerraBlock 24 EX/8 system from Facilis to explore working within the Facilis Shared File System. Migrating projects to the Facilis was painless, and the benefits of creating and sharing volumes between editors were immediate. “What Facilis does with project sharing is fantastic,” said Epstein. “For Avid, Adobe, and Autodesk workflows, when sharing projects and media, the TerraBlock system allows Lucky Post to utilize bin-locking to control write access to shared projects. It’s a perfect storage system for their needs because it’s truly application and platform agnostic." After successfully integrating the Facilis system into the workflow, the team upgraded to the full 96TB capacity making it their primary storage system for the post house. The FreeNAS based storage was at the end of its life in terms of support for the hardware, so it was relegated to a “very fast” near-line storage system, which in this case, allows them to have a mirror image of their data stored on the TerraBlock. As the entire facility continued to use the TerraBlock system, the organizational power of creating volumes quickly became apparent. The TerraBlock keeps the team accountable for how they use their storage; by creating volumes for each client and project, they’re able to monitor storage requirements responsibly. The TerraBlock is connected to approximately 20 clients, the majority connected over 10gig Ethernet with a handful of GigE connections for assistants and production staff needing to view material.